Fosy have joined up with the Use Your Head campaign and are offering an exclusive £5.00 discount on Fosy Originals purchased Online! Hillary, a Fosy Customer, contacted Fosy..
"Dear Fosy, I am writing to say a big thank you for possibly saving my life! Last year you persuaded me to buy a Helmet and Fosy band at the Birmingham Ski Show, a few months later I had an accident, I fell from a ski lift from over 4m up. My helmet was a write off but thankfully I did not sustain a serious head injury which I was told would have been very likely had I not been wearing a helmet. I now have 3 Fosy's in various colours, one for each outfit! Thank you Fosy!" "...our aim is to get all women to wear ski safety helmets." "Fosy Originals are delighted to be a partner of the 'Use Your Head' campaign because our aim is to get all women to wear ski safety helmets. 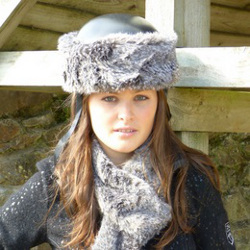 We are happy to offer a £5 discount on our entire range of fabulous faux fur accessories purchased from our online store which includes our best selling product the Fosy Helmet Band, Headbands, Cuffs, Boot Cuffs, Scarves, Boot warmers and our new Pom Pom range."